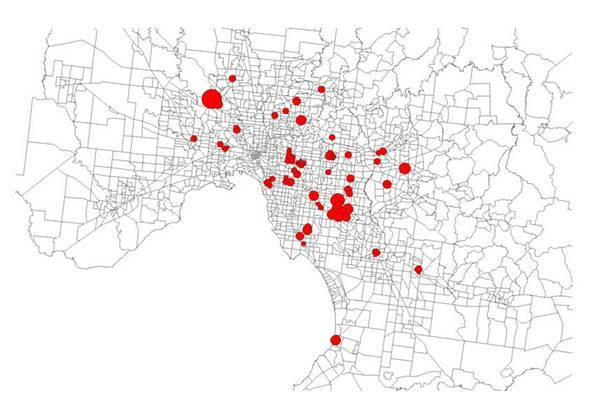 By 1981, only 35% of Melbourne’s jobs were located within 5 km of the centre. 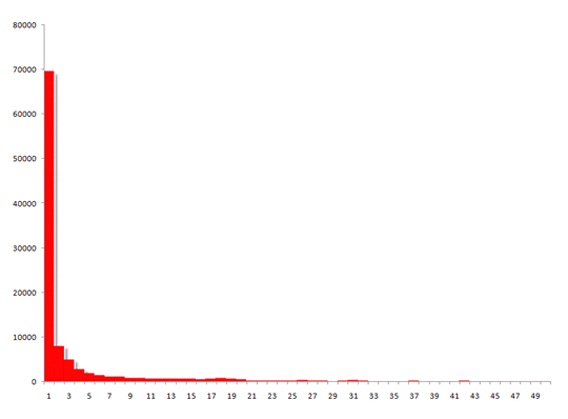 The “average job” was 12.4 km from the centre and the “centre of mass” of employment was 5.9 km away. The trend to the suburbs was very strong over the succeeding 25 years. By 2006 just 28% of jobs were within 5 km radius and the ‘average job’ was now 15.6 km from the centre. The centre of mass had moved 2 km further outwards to the vicinity of Tooronga, 7.9 km from the CBD. This pattern of dispersal held for all industry sectors with one significant exception. While over 80% of Retail and Manufacturing jobs were located more than 5 km from the centre, Commercial Services jobs were split roughly 50/50 between the inner city and the suburbs. This sector consists mainly of finance, insurance, business services and property services jobs. Those located in the CBD and inner city include major financial institutions and-high level producer services jobs servicing corporate clients. Those in the suburbs however tend to service the resident population – they are firms like real estate agents and personal financial advisers. The net result is the industry composition of the suburbs and the inner city are quite different. While they have much the same proportions of Community Services jobs, the suburbs have a significantly higher proportion of Manufacturing & Transport and Retail jobs. The inner city, on the other hand, is dominated by the Commercial Services sector – it accounts for nearly half of all jobs. It may surprise, but most high human capital jobs – that is jobs filled by a worker with a Bachelor’s Degree or higher – are located in the suburbs. The inner city has a higher density of graduate jobs, but the sheer size of the suburban job market means that in absolute terms it has more jobs filled by graduates. These high human capital jobs are located in suburban hospitals, universities, schools, local government administration and increasingly in manufacturing and warehousing. Commercial Services is the exception – two thirds of the high skilled workers in this sector work in the inner city. With 28% of all metropolitan employment in 2006, the inner city was an important job market for residents living in the central municipalities of Melbourne, Yarra and Port Phillip. However the inner city accounted for less than 10% of the metropolitan population, with the other 90% living in the suburbs. Around a quarter of workers who lived in the middle suburbs but less than 10% of outer suburban workers commuted to the inner city. Clearly, the great bulk of workers in Melbourne work in the suburbs. After a period of long decline, job numbers started to grow vigorously in absolute terms in the CBD and inner city from around the middle of the 1990s. Averaged over the period 1996 to 2006, inner city jobs grew at much the same pace as suburban jobs, meaning that the relative share of metropolitan jobs claimed by the inner city and suburbs did not change. It seems likely however that the share of jobs in the CBD and surrounds has increased since 2006. While the great bulk of Melbourne’s jobs are in the suburbs, most of them are dispersed rather than located within major centres. There were 31 major activity centres in Melbourne’s suburbs in 2006, which collectively accounted for 20% of all suburban jobs. Some of these centres cover a substantial geographical area. 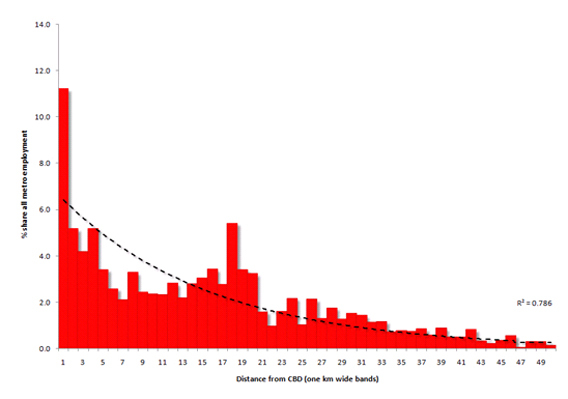 None of the centres approach the CBD in either size or density. Apart from the top four – which together account for more than half of all jobs in suburban centres – most are in fact relatively small. Of the 31 major activity centres, 30 are specialised in at least one industry sector and many have multiple specialisations. Commercial Services is the only sector in which no suburban centre specialises – that is the domain of the inner city and especially the CBD. Specialisation suggests that firms seek to avoid the burden of size and/or density associated with diverse centres, instead preferring lower cost centres with the sorts of firms with which they do business. This brief review of the geography of employment in Melbourne provides insights that are relevant to policy. It is clear that most jobs are in the suburbs and so are most industry sectors. Moreover most of Melbourne’s high human capital jobs are also now located in the suburbs. Most suburban jobs aren’t located in major activity centres, rather they’re at low densities in smaller centres or in stand-alone developments. 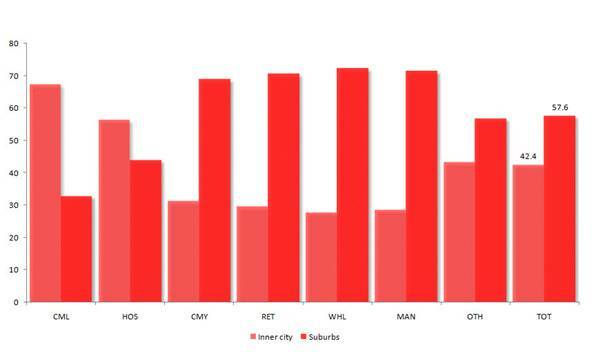 Suburban centres are themselves relatively low density areas when compared to the CBD. Finally, centres tend to specialise in a limited number of industries because most suburban firms incur higher costs but few benefits from locating with unrelated firms. Thus the suburbs are the major job arena in Melbourne. This is also true of other Australian cities like Sydney although there are local variations between cities. 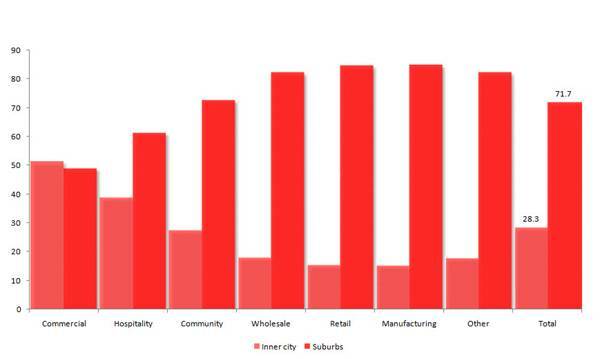 Density is not a strong locational driver of most suburban firms. This is partly because cars enable firms in a suburban setting to enjoy the benefits of agglomeration without high density. It is also partly because many suburban firms serve consumers directly (rather than other firms as is more likely the case in the CBD) and thus prefer relatively small centres which are easily accessible to their customers. The key challenge for policy suggested by this analysis is how to provide efficient and sustainable mobility for workers and businesses in a low density environment. The suburban geography favours private transport over public transport. Policy-makers ought to give attention to making private vehicles more efficient and sustainable. This suggests policies like pricing road space and pricing carbon. This is an edited version of an article, Suburban employment trends: a Melbourne case study, I wrote for the August issue of M/C Journal. The main difference is the journal version has more exhibits.